If you’ve ever watched Elf and wondered what that syrup-coated spaghetti tasted like, we’re happy to serve you something special this holiday. This year, we decided to get inspired by our favorite Christmas movies (like Home Alone) and TV episodes (like that first Gilmore Girls Christmas) and try out the festive foods they feature. And it was…well, a Yuletide artery-clogging experiment, to say the least. Watch the video below to see our editors try out seriously heinous pop culture meals, and scroll down for the recipes! Ingredients: Spaghetti, maple syrup, chocolate syrup, marshmallows, and M&Ms. 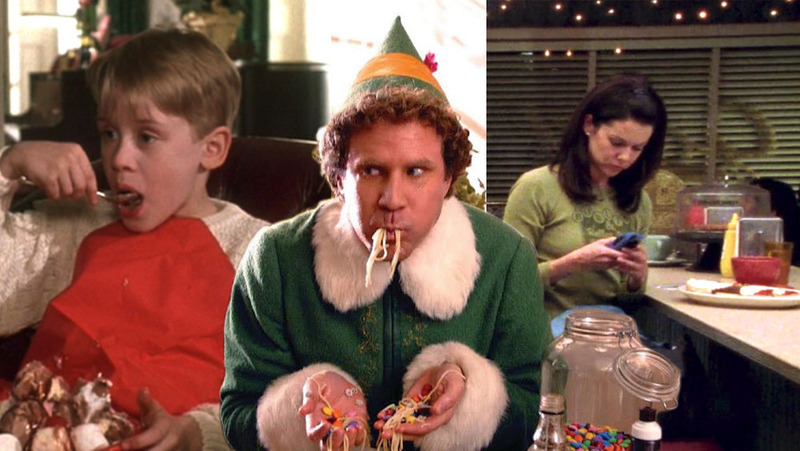 We love Buddy the Elf and respect his strict diet (candy, candy canes, candy corn, and syrup). But look, this is a one-way ticket to Diabetes Town, and a lot for any human to consume at once. Although after filming our Features Director took a bite and remarked that it was actually “not bad.” She probably has more Christmas spirit than the rest of us. Ingredients: Three hamburger buns, a burger, two olives, ketchup, cream cheese, and a sliver of tomato. You know what, Lorelai never got around to actually eating this in the episode (she had to bail after she found out Richard had a heart attack). That left us with figuring out the logistics of just how to eat this. If nothing else, Luke gets serious points for presentation. Ingredients: Mint Chocolate Chip ice cream, Cherry Garcia ice cream, Salted Caramel Core ice cream, chocolate syrup, and maraschino cherries (throw huge marshmallows on top for extra extra-ness). Oh, and a Pepsi to wash it all down. Sadly Tator Crunch was not on the menu ’cause it’s like, 2017. But you know what, Kevin McCallister might actually be a genius. Even though our girl-in-charge (i.e. the sadist typing this now) tried putting together a sinister concoction of clashing flavors she was fond of, it actually ended up tasting…well, like a sundae. Even the Pepsi at the end was a refreshing touch. Merry Christmas, ya filthy animal!